When we last left you, I was chiding Pam for making recipes from the autumn section of the Southern Living Farmers Market Cookbook during winter. I stuck with the winter section and made Sweet Potato Stew with Red Beans and Citrus Salad with Orange Vinaigrette. And while spring has since sprung, the stew would certainly work for these still-chilly nights, and the salad is just too good not to make. Charlie Vergos, founder of the Rendezvous, passed away this morning. He was 84. You want to pinch what? It's day one of the 20-day "win a bucket of crawfish" promo held by City Auto in anticipation of April 18th's Rajun Cajun Crawfish Festival. Normally, the festival, an annual fund-raiser for Porter-Leath held downtown at Wagner Place, offers 500 pounds of free crawfish to first-comers. The City Auto contest is in lieu of that. Having made falafel many times, I know it’s as easy to whip up as it is to screw up. I have baked it, fried it, used a box mix, and started from scratch — all to varying results. So when I’m looking for consistency in this Middle Eastern chickpea patty, I leave the kitchen and go to Sean’s Café for the Falafel Plate. Carolyn Nichols leads a cooking class at the Wellness Center. In this week's Food News, Hannah Sayles takes a cooking class at the Church Health Center's Wellness Center. The dish is that it's National Nutritional Month, and this dish, in particular, is shepherd's pie. I just returned from Austin, TX, and brought some local treats back with me. At every coffeeshop and convenience store, I saw these Mary Louise Butters Brownies with their adorable little wrappers. When I took a closer look, the strange assortment of flavors drew me in. It's Free Cone Day, from noon to 8 p.m., at all Ben & Jerry's. The event in 1979 began as a "thank-you" to customers. "Yes, we have quite a bit more ice cream in stock," says Michael Phillips, assistant manager of the Black Road store in East Memphis. Phillips says a nice day like today might draw around 150 to 200 folks to his store. But on Free Cone Day, they're gearing up to serve between 3,500 to 4,000! Find your nearest Ben & Jerry's here. Product Test: "Southern Living Farmers Market Cookbook"
Are there any cookbook buzz-words more popular these days than “seasonal produce"? Apparently not, based on the number of new titles released over the past few months. Not that we’re complaining. When two copies of the Southern Living Farmers Market Cookbook arrived at the Flyer, Susan and I stopped everything to pour over the books. Then we happily toted them home and tried out some recipes. I've spent years coveting the clothes in the Anthropologie catalog, and now that they've finally opened a store — today at Saddle Creek! — I am outraged. Just as there's easy-access, I've aged-out of any clothing that even approaches the flirty hemisphere. Aw, well. There's always the cute kitchenwares, such as this set of measuring spoons. This set was included in every foodie blog's Christmas gift guide. While the grand opening of Escape Alley Sundry is scheduled for March 26th, they opened for their soft launch today — St. Patrick's Day — with an eye toward celebrating their first anniversary on the holiday. Owner Russell Wild, an artist and architect, converted the building at 651 Marshall after he was laid off in August. "I built it as a place to hang out, eat a little, have some beers." "I'm both intrigued and repulsed," said a coworker of the Doritos Late Night all nighter Cheeseburger. I had spotted a bag of them in the snack machine in our breakroom. Since I'm big fan of not leaving well enough alone, I had to get them. I wasn't going to eat them myself — I'm no fool — so I had a handful of coworkers try them. On Saturday, after the Southern Women's Show, Pam Denney and I went to the Emerald Thai Restaurant. I hadn't been there in years and was looking forward to trying it again, and Pam was craving their rich Tom Kha Kai soup. 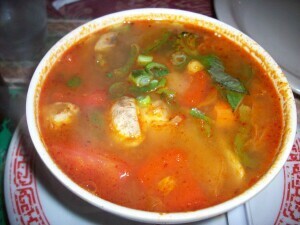 Soupwise, I opted for the Tom Yum Veg. Yowza, this is a delicious soup ... and one with consequences! When I spoke with Crave chef Jason Doty about his Hand-Crafted Name contest, he said it was inspired in part by the Break the Chain - Eat Local movement. Turns out that this very cool, very low-key movement — for which local independently owned restaurants show solidarity through T-shirts — can be traced back to Memphis' favorite cupcake-pusher Kat Gordon, owner of Muddy's Bake Shop. March 15th marks the 40th anniversary of Huey's, and let's face it, Memphis would be less Memphis-y without the Huey Burger. But while today is the day, the big party is April 18th at the original Huey's at 1927 Madison. The celebration will include live music by the Settlers (late Huey's owner Thomas Boggs was in the band), Funk de Ville, DiAnne Price & Her Boyfriends, and the Soul Shockers. A portion of the proceeds from day's sales goes to the Church Health Center. Did you geek-out and make a pie for Pi Day?